Whiskey Lake-U doesn't offer much in terms of performance enhancements over its immediate Kaby Lake-R predecessor based on our initial benchmarks with the Asus Zenbook UX433. It's largely forgettable if you already own a Kaby Lake-R laptop, but users with older systems will still see value if deciding to upgrade. After an admittedly impressive gen-to-gen performance boost with Kaby Lake-R last year, it was perhaps inevitable that this year's Whiskey Lake-U would offer a much smaller improvement. We recently benchmarked the Core i7-8565U in the new Asus Zenbook UX433 and raw performance results are pretty much the same as the Core i7-8550U CPU that it is set to replace. Our graph below directly compares the new i7-8565U in the Zenbook UX433 to the last generation i7-8550U in the Zenbook UX430 when running CineBench R15 Multi-Thread in a loop. The newer Whiskey Lake-U processor is just marginally better at maintaining faster Turbo Boost clock rates than its predecessor for a performance advantage of about 5 to 8 percent at best. In contrast, the performance jump from Kaby Lake i7-7500U to Kaby Lake-R i7-8550U can be as high as 75 to 90 percent. In short, the end-user will likely not notice any differences between a laptop running on the i7-8550U or i7-8565U. The main reason why Kaby Lake-R was such a huge leap over Kaby Lake was its doubling of physical cores. In contrast, the Whiskey Lake-U series is only a minor update on the same 14 nm fabrication process with more integrated PCIe lanes (16 vs 12) over Kaby Lake-R. Core attributes like cache sizes, the integrated UHD Graphics 620 GPU, and base clock rates (1.8 GHz) remain identical between the i7-8550U and i7-8565U. It's entirely possible that other manufacturers will offer laptops with a stronger implementation of Whiskey Lake-U than our Zenbook UX433. The i7-8565U in the Asus laptop alternates between 2.0 GHz and 2.7 GHz when under extreme processing loads instead of maintaining a fixed clock rate of 2.7 GHz or higher. Thus, a laptop with superior cooling than our Asus may have a good chance of holding higher Turbo Boost clock rates for faster performance. Until then, however, our first impressions for Whiskey Lake-U are mild at best. 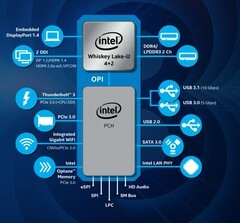 The take away message is that owners of Kaby Lake-R laptops equipped with the i5-8250U or i7-8550U have almost no reason to upgrade to Whiskey Lake-U. Users who may be sporting Kaby Lake laptops or older, however, may want to consider a Kaby Lake-R laptop soon since retailers will be clearing stock to make room for Whiskey Lake-U systems.